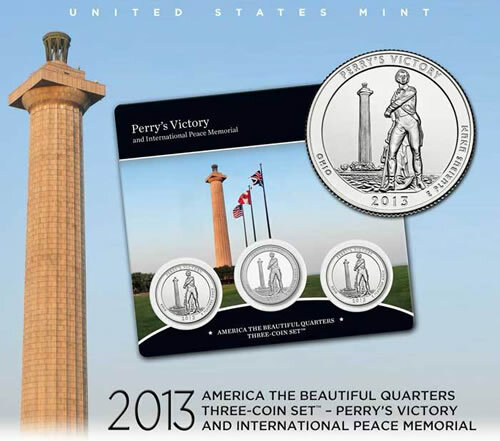 Today, April 16, 2013, the Perry’s Victory and International Peace Memorial Quarters Three-Coin Set officially went on sale at the United States Mint. 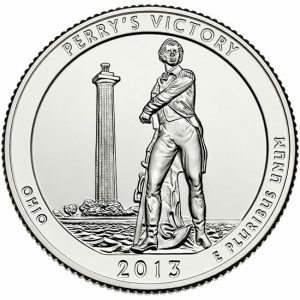 an uncirculated 2013-D Perry’s Victory quarter from the U.S. Mint at Denver. Perry’s Victory and International Peace Memorial is a national site found in the state of Ohio. It receives over 90,000 visitors annually. "Perry’s Victory and International Peace Memorial was established to honor those who fought in the Battle of Lake Erie, during the War of 1812, and to celebrate the long-lasting peace between Britain, Canada and the U.S," describes www.nps.gov/pevi "The Memorial, a Doric column, rising 352 feet over Lake Erie is situated 5 miles from the longest undefended border in the world." Displayed on durable, plastic card with a colorized scene of Ohio’s monument, both sides of the three collector quality quarters are visible. The card also includes a brief description of Perry’s Victory and International Peace Memorial and a Certificate of Authenticity. The Perry’s Victory Quarters Three-Coin Set is the 17th released since the America Beautiful Quarters debuted in 2010. America the Beautiful Quarters Three-Coin Sets are popular in the coin collecting community. In the first few days, about 10,000 sets will sell. Buying activity will eventually taper off after another 5,000 to 10,000 are ordered over the next several months. Three-coin sets are just one option in the quarter program, along with the circulation quality coins found in bags and rolls as well as various collector quality proof and uncirculated annual sets. Circulating quality Perry’s Victory quarters debuted on April 1, 2013. That is the day the Mint began selling them in bags and rolls and when they started to make their way into circulation for commerce. These coins are the second of the year in the America the Beautiful Quarters® series, and they feature a reverse design emblematic of the park. Buyer may place orders directly through the U.S. Mint via its online catalog found here and at 1-800-USA-MINT (872-6468). Previous 2010-2013 America Beautiful Quarters Three-Coin Sets are also available. Don Everhart designed and sculpted the artwork on the reverse of Perry’s Victory and International Peace Memorial Quarters. It features the statue of Master Commandant Oliver Hazard Perry, with the Peace Memorial towering in the distance behind him. 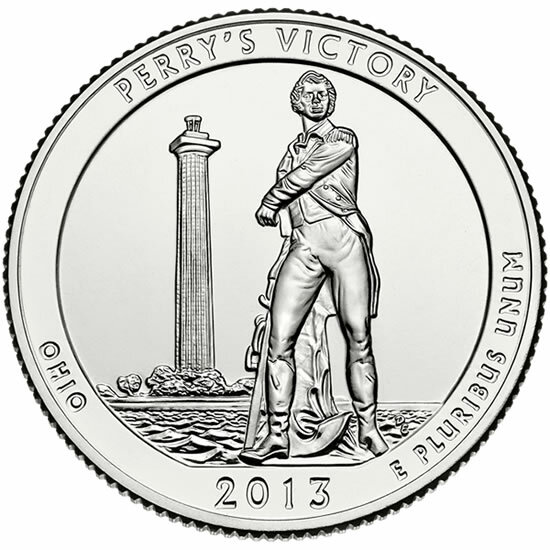 Inscriptions are PERRY’S VICTORY, OHIO, 2013 and E PLURIBUS UNUM. Like the other America the Beautiful Quarters, the obverse features a portrait of President George Washington by John Flanagan. Inscriptions include UNITED STATES OF AMERICA, LIBERTY, IN GOD WE TRUST and QUARTER DOLLAR. Three more quarters are due for release in 2013, because the U.S. Mint releases five new quarters per year. Each one showcases different reverse designs, all emblematic of a national park or site found in the United States or one of its territories. As mentioned earlier, the program debuted in 2010. It is scheduled to end in 2021. The next three 2013 America the Beautiful Quarters will honor Great Basin National Park in Nevada, Fort McHenry National Monument and Historic Shrine in Maryland, and Mount Rushmore National Memorial of South Dakota. (See the 2013 coin images.) The first to launch this year featured White Mountain National Forest in New Hampshire. Oh be still my heart for this wonderful awe-inpiring design! Is that a golf club in the dude’s grip there? Or maybe a walking stick?